Thanks for visiting! We're glad you chose to take a look! Harrys House Durham offers comfortable 3 STAR RATED self catering accomodation situated in the village of Carrville, just 3 miles from the Heart of the Cathedral City. With plenty of space for up to 7 guests we offer private off street parking and exclusive use of Harrys House comprising of kitchen, dining room, lounge and modern bathroom with separate shower and bathing facilities. Upstairs our 3 bedrooms consist of a large woodland themed master suite with double bed and seating area which can also be converted into a further double and 4 door wardrobe with full length mirrors. 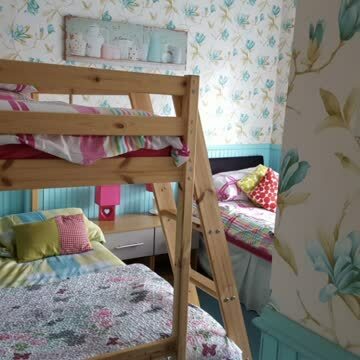 A colourful and bright family room that accommodates a double with bunk above and a single bed and a comfortable single room. All bedding and fluffy towels are provided at no extra cost. We are also pet friendly providing dog bowls, towels,toys and treats.. they are on holiday too! For children we can supply safety gates, travel cot and high chair if required as well as child friendly plates, beakers etc. The property is fully equipt with central heating,fridge and freezer for larger parties,washing machine and freeview tv. We offer all of the little things that make Harrys "a home from home" including your own welcome basket. Harrys House operates a NO SMOKING POLICY within the property; however we do have sheltered spaces and seating outside. Full use of a large entertaining space in the secluded garden complete with wood fired hot tub makes Harrys the ideal place for get-togethers with friends or a romantic break..it really is up to you!